Sorry for the delay between posts. 5 days in Byron and some additional travel have kept me away from solid internet and my computer, so heaps have happened in the interim. 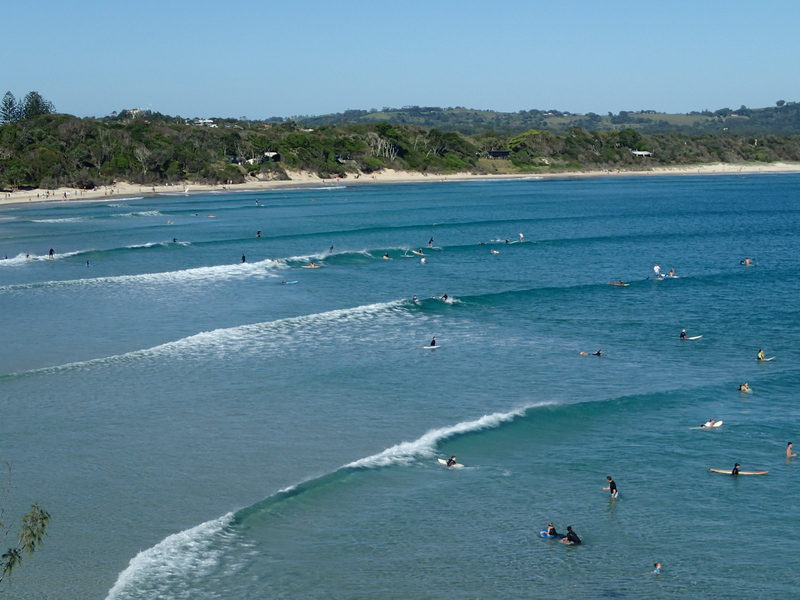 Got up to Byron on Thursday afternoon. Took a bus from Ben’s grandmother’s down to Byron, which took a little over an hour and a half. The drive down was beautiful but strange. The landscape reminded me very much of home, but with more variation in elevation. Most of the land was agricultural, probably 90% pasture and 10% cultivated. Cattle were everywhere on the green rolling hills, and the cultivated land was mostly sugarcane. Bit of a difference however, between the “beach” at the Williams Dam, and the outstanding coastline that abutted the farmland in New South Wales. The agricultural land went all the way to the ocean, only being bisected by the highway. This concept seemed absolutely mental to me as there is no where in the States that has good weather and 70 consecutive miles of beautiful coastline that hasn’t been developed. Not sure whether it was the sea air of the cowshit, but the Conquest smells an opportunity. Might need to recruit a Spreen for this one though. I’m still rating “Unsatisfactory” with my gentleman farming skills, so I’ll defer to the experts. Upon arriving in Byron, we checked into our hostel and went to have a look around. 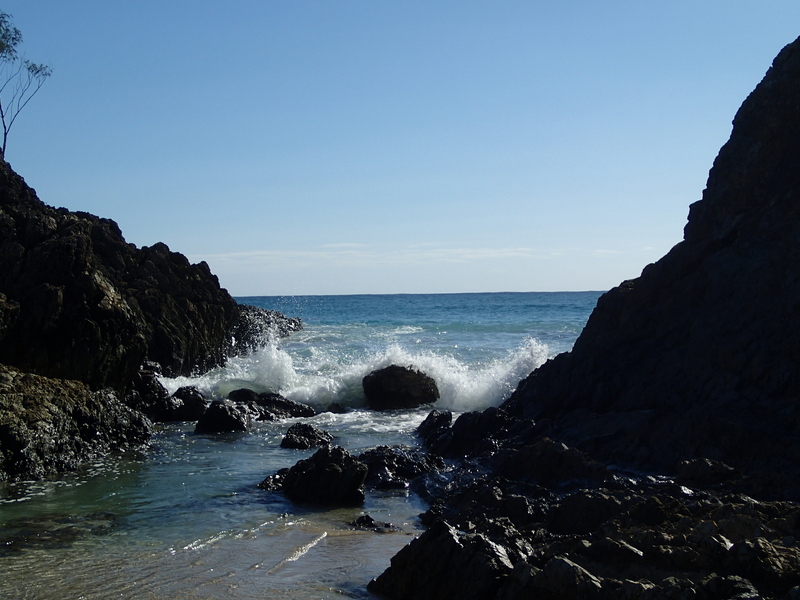 Again, the beaches were beautiful, but Byron was the busiest beach we’ve seen by far since I’ve gotten to OZ. Between 35-40k people a day attended the Blues and Roots Festival, and Byron Bay is a town of 9,000 people. It was absolutely packed to the gills as it was also the Easter Holiday weekend, and families from around the area converged as well. The hostel was well appointed. 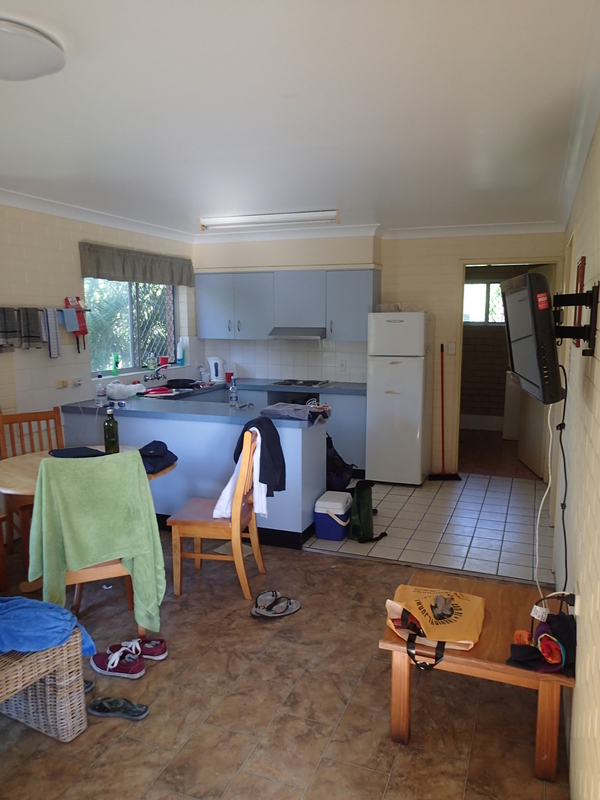 We basically had a 2 BR apartment with kitchen, sitting room, and a deck. Our bedroom was 2 sets of bunkbeds which we shared with a rotating cast throughout the weekend. The other bedroom was a single full bed, which was occupied by 3 different couples. 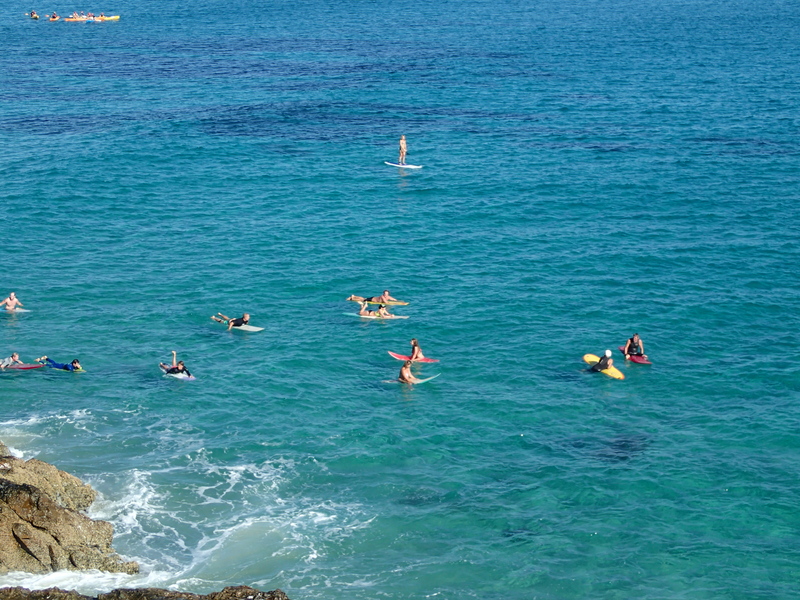 We were about two blocks from the center of town, with bikes and surfboards available for free through the hostel. One morning I jumped on one of the beat up beach cruiser and headed up to the beachside market. Every handmade good imaginable was on offer, from hand pressed natural antibiotic from tea trees, to painted concrete mushrooms, all the way to some of the most beautiful sunset surfing pictures I’ve ever seen. The whole atmosphere is one of community first, sales second. There are booths stretched for over a half mile, and people are elbow to elbow moseying through, arms full of artisanal this and that, cash being put into the hand that made the product. Not a bad little economic system they’ve worked out there on the beach. 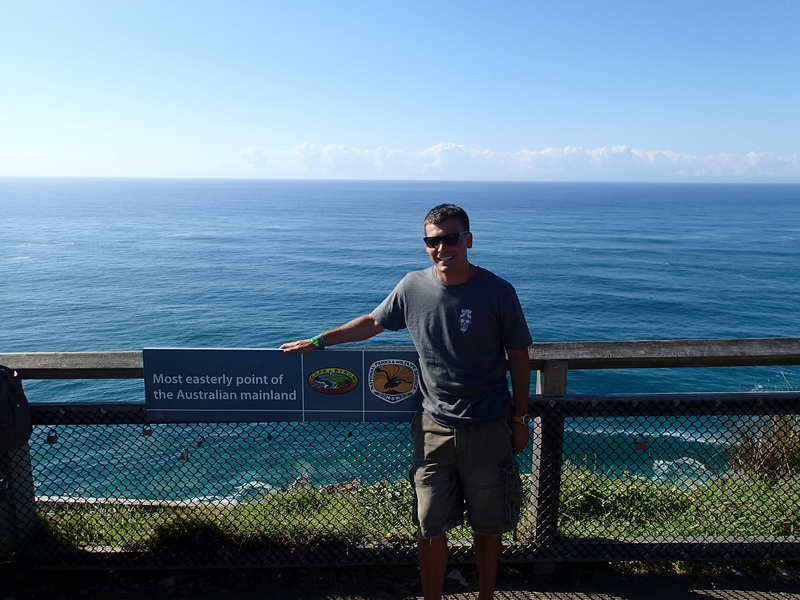 Byron is the most easterly point of continental Australia, and on Monday morning, our Kiwi roommate Ryan and I headed out to go take a peek from the point. A friend of mine from home, Jade Wagner, had also suggested this, so I figured it was worth the time. 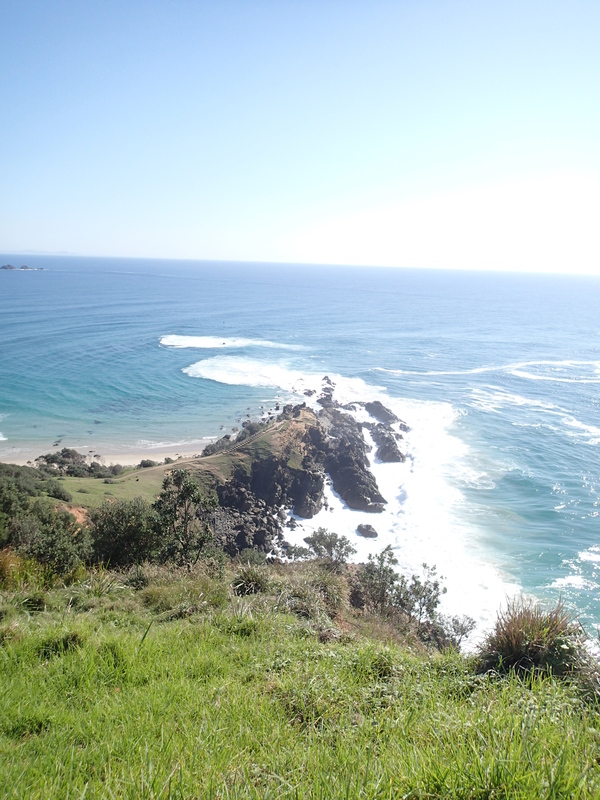 The view was phenomenal, about 200 feet above sea level looking down over Byron and then Tallow Beach to the south. 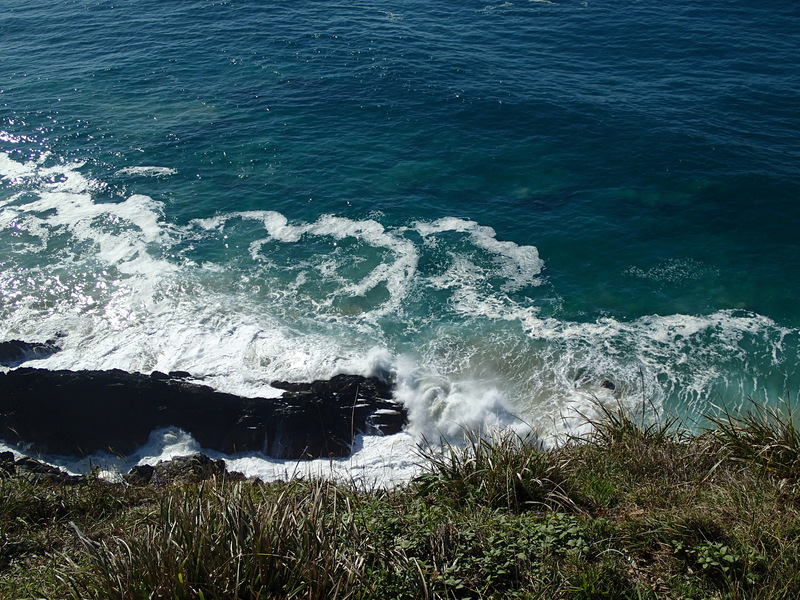 Beyond the point, there is a group of about 800 dolphins that congregate in the area. Unfortunately without a telephoto lens, I couldn’t get the pictures to turn out very well, but I saw heaps of dolphins swimming just northeast of the point. To see 10-15 fins going around was outstanding. 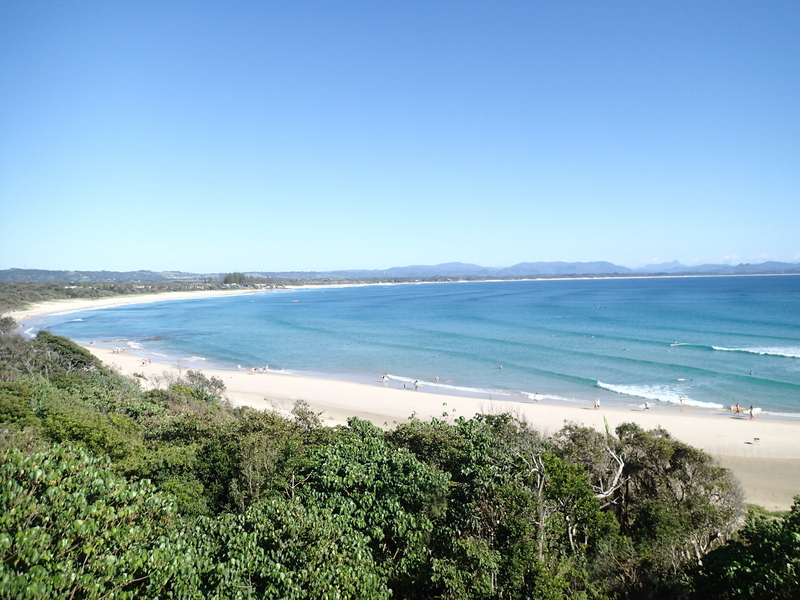 We were too early (or is it late since winter is beginning here) in the season to see the whale shark migration, but if anyone ever has the desire to see it, Byron Bay would be an absolutely outstanding place to do it from. From these guys, I got to hear about Nimbin, the local hippy run town, complete with police force, post office, etc. It is just a wild place where anything goes, drugs are available anywhere you ask, and people just generally hang out and make handmade goods for sale at local markets. I also got to hear about the busking end, one of the guys, Yamos, has been a “professional busker” for over 30 years. He’s a Greek from Devonport, New Zealand originally, and he is absolutely terrified of cities. Yamos was really interesting though. Coming in sporting a thin blue headband over his neck length white hair, Yamos gave me the flavor of Byron. First he started talking about the population growth in Byron (a town of 9,000 that is aggressively trying to thwart a western “suburb” which would increase the population to about 12,000 total. He also talked about teaching music in Devonport, and his friendship with “Ellie” a woman who would become Lorde. She was a child prodigy discovered at age 9, and would give free concerts in town often until she signed with Universal at the age of 13. Yamos said she is absolutely brilliant scholastically as well and that she’d be the biggest star in the world someday. Considering her fame at the age of 17, I’d say he’s got a decent chance of being right. Yamos and John also talked about cops and busking. Byron recently passed a shire wide ordinance requiring buskers to be registered. This…displeased the local busking population. After the festival one night, I saw 3 cops busting two buskers on Jonson Street about 2:30, and hiding around the corner in an alley was…John. Just refused on principle to register, so he was playing cat and mouse with the police all night. Yamos told me that he typically makes 250-350 most nights he performs, so John’s ideological purity was costing him mightily. These interactions are really the best part of travel. You might have worn the same 2 shirts for the last week and smell a bit like that kid in 3rd grade everyone avoided, because you don’t have access to a washing machine. The limited sleep you catch, on a sweaty twin sized mattress, in a camp style bunkbed, is punctuated by a couple of new strangers every night. Checking in at the airport, tells you you’re going to Sydney, not Melbourne, then routes you back through Adelaide and double charges your card, pushing you off on an exasperated check-in girl at the end of her shift. Two hippies roll up to your unlocked hostel room in the middle of the afternoon and seem to know no one. Then you talk to the two hippies who have made a life of singing on street corners, and have every line on their face and a roach burned thumb to prove it. The sweaty stranger above you becomes a buddy, and you find out about how life is for a gourmet dog food sales rep in New Zealand and Australia. A couple of British birds come in in the middle of the night, and give you an arms length list of things to do in Vietnam. That horsed up flight gets fixed by that exasperated girl, and you end up getting a direct flight that lands 3 hours earlier. Sure as hell beats your average Thursday.